In 2009, 59.2 percent of women were in the labor force: of 122 million women in the United States, 72 million were classified as either employed or unemployed. The percentage of women in the labor force has been relatively stable over the past several years. Women's labor force participation rate peaked at 60 percent in 1999, following several decades of growth in women’s labor market participation. In 2009, the overall unemployment rate for women was 8.1 percent: of the 72 million women in the labor force, approximately 6 million were unemployed. These data are from the Current Population Survey (CPS). 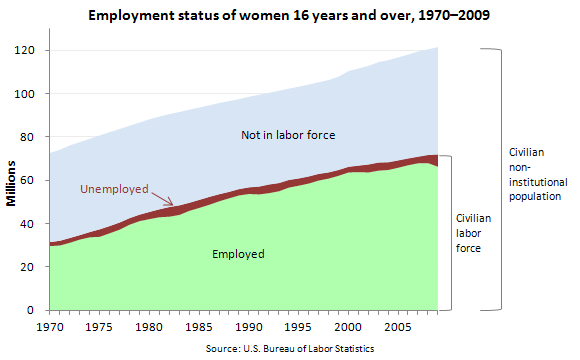 To learn more, see Women in the Labor Force: A Databook (2010 Edition), BLS Report 1026, December 2010. The civilian labor force participation rate is the civilian labor force as a percent of the civilian noninstitutional population. The civilian labor force comprises all persons classified as employed or unemployed. Employed persons are those who did any work at all as paid civilians; worked in their own business or profession or on their own farm; worked 15 hours or more as unpaid workers in a family business; or were temporarily absent from their jobs because of illness, vacation, bad weather, or another reason. Unemployed persons are those who had no employment during the survey week, were available for work at that time, and made specific efforts to find employment sometime in the prior 4 weeks. Bureau of Labor Statistics, U.S. Department of Labor, The Economics Daily, Women in the labor force, 1970–2009 on the Internet at https://www.bls.gov/opub/ted/2011/ted_20110105.htm (visited April 24, 2019).